Looks basic but doesn’t taste it! I came up with this recipe when trying to make a carrot ginger soup a few years ago. I had done a bunch of substitutions and just left out other ingredients and then decided not to puree the soup at all, and voila, carrot ginger stew was born! This dish freezes well and looks good in a big platter/serving dish, so it’s great to have on hand for unexpected guests or to bring to a potluck. I’ve made the dish today because I have some houseguests coming in a week or two and I want to have a dish that I can just pull out of the freezer, and serve over some quickly made quinoa so that I can spend time with my guests instead of in the kitchen. It makes enough that I packed some for the DH for lunch tomorrow as well. And if you’re on a budget, it’s inexpensive as well! Fry the garlic and onions in the butter until translucent and fragrant. Toss in ginger and carrots and stir until ginger has sort of melted into the butter sauce. Add in bouillion and water and boil until carrots are soft. Serve over quinoa. Freezes well. I wrote to use fresh ginger above, but all I meant was not powdered ginger. I use frozen ginger myself – I peel the ginger using a spoon (just try it, it works!) and then pop the peeled ginger into a ziploc bag and freeze until I need some for a recipe. Then I just grate the amount needed. No waste! Because we all know that I don’t like to waste food! I served this over quinoa that I had boiled up with some arugula. Quinoa has 14% protein (and it’s a complete protein) and arugula and carrots are super healthy, so this is a tasty, feel-good meal! The quinoa + arugula was leftover from a meal I had packed for a hike this weekend. 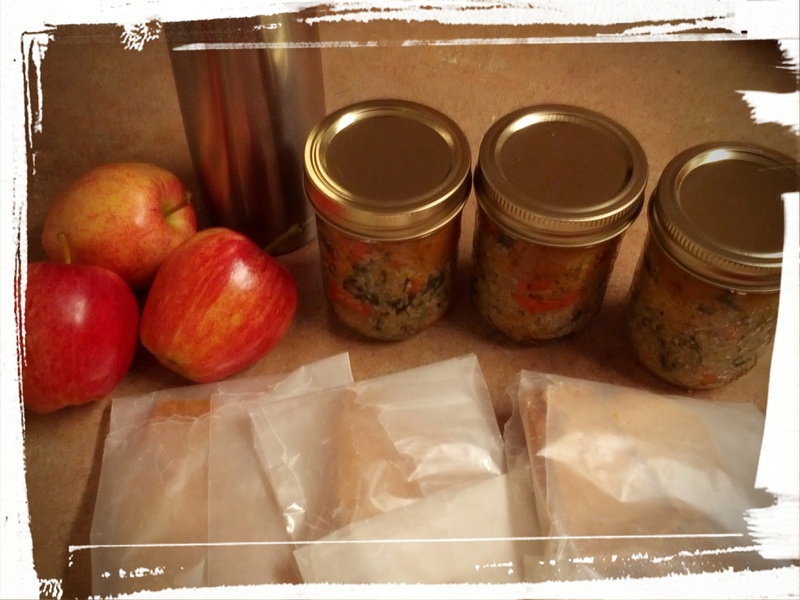 I had made a paneer curry and packed it with the quinoa in mason jars (so cute! so environmentally friendly! so hipster!) as well as making a chai tea (recipe to come in a later post) and a cashew honeycomb brittle (recipe in a later post as well). And then I promptly forgot the mason jar portion of the lunch at home. Ah well. Lunches for this week? Accomplished! A delicious, healthy, balanced lunch to keep hikers warm on a cold day. Assuming one remembers to actually pack it. Next Post: Am thinking up delicious cookie recipes. Should I make Mint Oreo cookies? Or Almond Boeterkoekjes? Let me know in the comments! 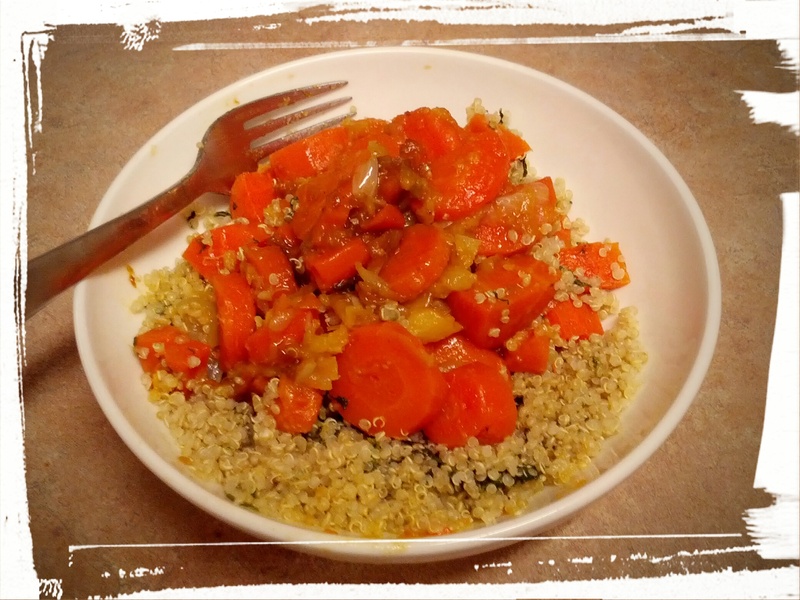 This entry was posted in Vegetarian Main Dishes on November 19, 2014 by Margaret.